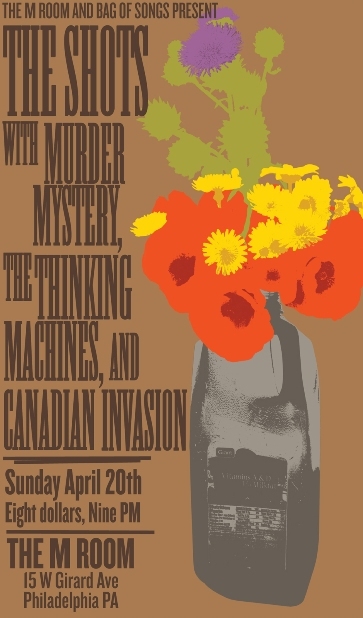 BOS Presents : The Shots,Murder Mystery,Thinking Machines, Canadian Invasion PLUS A CD Giveaway ! The M Room in Phildelphia is where you need to be tomorrow night to catch the first “Bag Of Songs Presents” night. Here’s a little preview of what you have in store, plus, read all they way down for info on a CD giveaway ! Why you need to see The Shots : Ever say to yourself I wish I could have seen Led Zeppelin in 1969,or The Who Live At Leeds,or U2 in small club,or [insert your most lamented “I wish I saw them when”, musical regret here]. Well don’t blow it again. Your time is NOW to see The Shots delivering their amazing show in small venue. Making their Philadelphia debut is Murder Mystery who released their album Are You Ready For The Heartache Cause Here It Comes in the fall of 2007 and have been garnering non stop accolades ever since. Bring your dancing shoes because their retro meets indie grooves will have you jumping around like you’re at a fifties sock hop. This essentially the cd release party for The Thinking Machines who released their excellent A Complete Record of Urban Archaeology in early 2008. A rhythmic guitar driven record that translates exceptionally well into a powerful live show. Think something along the lines of Fugazi meets Gang of Four, or The Constantines and you’ll have an idea of what they’re all about. Canadian Invasion holed up at Philadelphia’s Miner Street Studios with the amazing production team of Brian McTear and Amy Morrisey to record the followup to their Songs For The Atco Ghost and recorded what is currently one of the best unreleased records of 2008 in Three Cheers For The Invisible Hand, a jangly, harmony laden, lyric rich gem of a power pop record. GIVEAWAY : You can’t buy their album yet, but I have five copies to give away of a special limited edition 3 song sampler CD from Canadian Invasion‘s Three Cheers For The Invisible Hand. All you need to do to win is leave a comment or send an email to bagofsongs@gmail.com with “CI Contest” in the subject line. I’ll pick five random winners on Tuesday April 22, so don’t waste any time, get those entries in now. Mark your calendar now for Sunday April 20th and be sure to head on out to the inaugural Bag Of Songs Presents night at Philadelphia’s M Room. Featuring three of Philly’s finest bands The Shots, Thinking Machines and Canadian Invasion along the with what I’m pretty sure will be the Philadelphia debut of New York City’s Murder Mystery. A guaranteed night of great music and fun. See you all there.